Last week, the Fort Thomas Education Foundation (FTEF) held a casual meet-and-greet at Fort Thomas Coffee. The get-together was attended by about 24 people including foundation and schoolboard members, as well as parents from all five of the district’s schools. 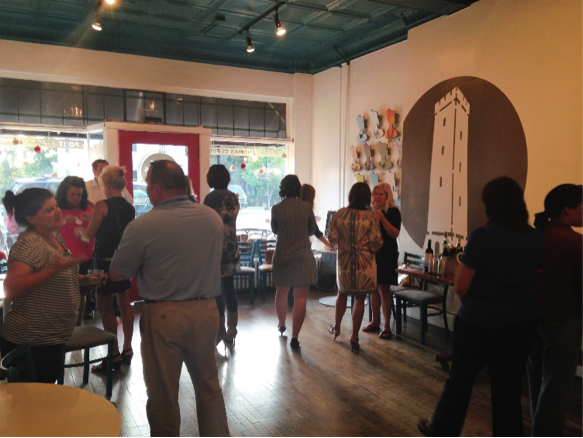 The informal gathering, which included refreshments and hors d’oeurves, was intended to inform people about the foundation’s vision of ‘creating a private school experience for all students K-12’ and encourage participation from all families with children in Fort Thomas schools. The FTEF was founded in 2000 and has raised over $11 million. $9.5 million has funded building renovations across the district. Nearly $600,000 has been awarded to teacher grants for classroom resources and materials. Chairman Amy Shaffer, who addressed the group, said the main priorities currently are finishing the Campaign for Highlands and increasing the endowment, which now sits upwards of $300,000, to $1 million. She went on to add that the open house, the first of its kind, exceeded her expectations, and that she hopes to do it again in the future. Fundraisers, held throughout the year, include a dance in March, and ‘Foundation Club’, which offers “bird’s eye” viewing with catered service at home football games. 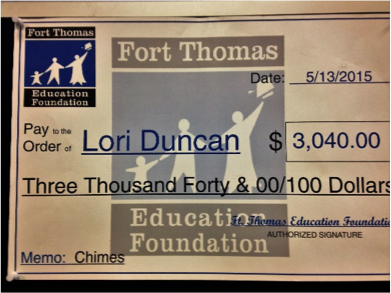 Next up, in October, is the annual appeal to all households with current Fort Thomas students. Just one example of the kind of grants FTEF funds in the district. The FTEF 2014/15 Annual Report is available online now at www.ftef.org. Those unable to assist financially are encouraged to help where they can. The FTEF has many volunteer opportunities available for those wanting to get involved including working on the Annual Dance or Foundation Club Committees. Industry expertise is always welcomed, particularly photographers, web & app development and general fundraising expertise. For more information about FTEF or to learn how you can help, contact Sally Race at: ftef@fortthomas.kyschools.us or call her at 859-815-2004.